Sri Jagannath is regarded as the supreme god and the rituals of Jagannath can broadly be divided into three parts - the daily, the occasional and the festive. 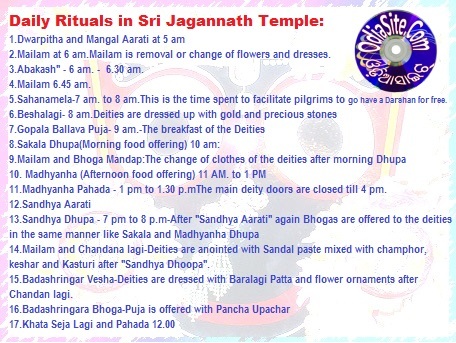 In Jagannath temple these rituals assume the term 'niti'. After the opening of door, Mangal Aarati is performed where there will be five specific sevayats and there will be verification of the “seal” given by a particular sevayat in the last night. Mailam is removal or change of flowers and dresses. The clothes, flowers, and Tulasi leaves worn on the previous night will be changed and “Tadap” and “Uttariya” are worn by the deities. 3.Abakash" - 6 am. - 6.30 am. Abakash is purification rites like bath and brushing of teeth where the Jyotishi of the temple reads out the Tithi and other details of the day and rituals to be performed. There will be Change of the deities clothes Tadap and Uttariya and wear another set of clothes. One lamp called Akhanda Baithai will be lighted where it continues to burn till “Pahuda” or the time of bed to deities. 5.Sahanamela - 7 am. to 8 am. This is the time spent to facilitate pilgrims to go have a Darshan for free. The Sahanamel is performed after Sandhaya dhupa and Sakaldhupa in the month of Kartik and Pausha. The darshan is sometimes not allowed for special rituals of the Deities. Deities are dressed up with gold and precious stones to suit different festive occasions which can be witnessed from little distance which is called Bhitara Katha which takes place after Sahanamela. 7.Gopala Ballava Puja- 9 am. The breakfast of the Deities like banana, curd ,chipped coconut, sweet popcorn are offered and pooja is performed with pancha upachar at this time. 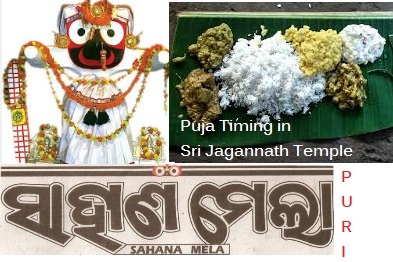 Three Pujapandas perform pooja where they sit on Ratna singhasana and worship Subhadra, Lord Jagannath, Shri Balabhadra, Sri Devi, Bhudevi, and Sudarshan. The food offered to the Deities or morning Bhoga contains green leaves, cakes, rice and khechudi. The change of clothes of the deities after morning Dhupa and pooja,again a pooja takes places in “Bhoga Mandap” a Garuda pillar. The main deity doors are closed till 4 pm. Again aaratis are performed in the evening after Madhyana Dhupa Mailam after "Aarati" is over, the deities change their clothes and wear another set. Deities are anointed with Sandal paste mixed with champhor, keshar and Kasturi after "Sandhya Dhoopa". Deities are dressed with Baralagi Patta and flower ornaments after Chandan lagi. Puja is offered with Pancha Upachar by the Puja Pandas with Pakhal (watered rice), Kadali bada, Khiri, Kanji etc. This is the last bhoga of the day. The bedsteads of the deities are arranged. The Deity of "Sayan Thakura" is carried from Bhandarghar to Ratna vedi or Ratna simhasana and place the deity near Lord Jagannath. Then follows offering of green coconut, betels and camphor aarati and then deities retire to their beds. 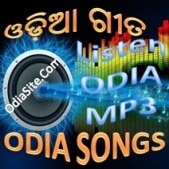 The door is sealed then by the Sevayat (Talichha Mohapatra). Temple is closed and no visitors or outsiders are allowed to remain inside.